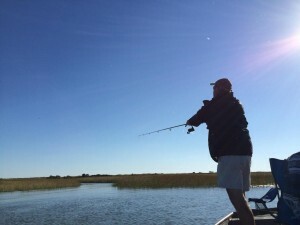 Guided Fishing Trips: Catch croaker, flounder, speckled trout, redfish or striped bass in secluded waters on a skiff with a fly rod or light spinning tackle. Your guide knows the local waters and will plan a trip based on your interests and current conditions. New for 2018: Family Fishing Trip: Get Dad or Mom get out fishing with a son or daughter on a trip from the Cape Charles Harbor. Tackle and bait included.